Writing blogposts is a proof-of-concept for me having them as a knowledgebase. For a some time when writing any note I use AsciiDoc(tor) format. Thus I started to search for option that allows me to write blog-notes that way too. I could see that many people host blogs at http://github.io I decided to try that way too. I started by looking for a tool to generate static webpages with AsciiDoc support. There is the mostly used Jekyll - written in ruby, generating a webpage from template on your local machine. There is plugin for AsciiDoc. Other tool that I was evaluating was :awestruct. So far so good. I decided to give it a try. Process of installation is quite simple - you fork repo, change config file and you can start to write a blog posts inside of the administration console. Nevertheless check knowledgebase to HubPress and documentation on GitHub. 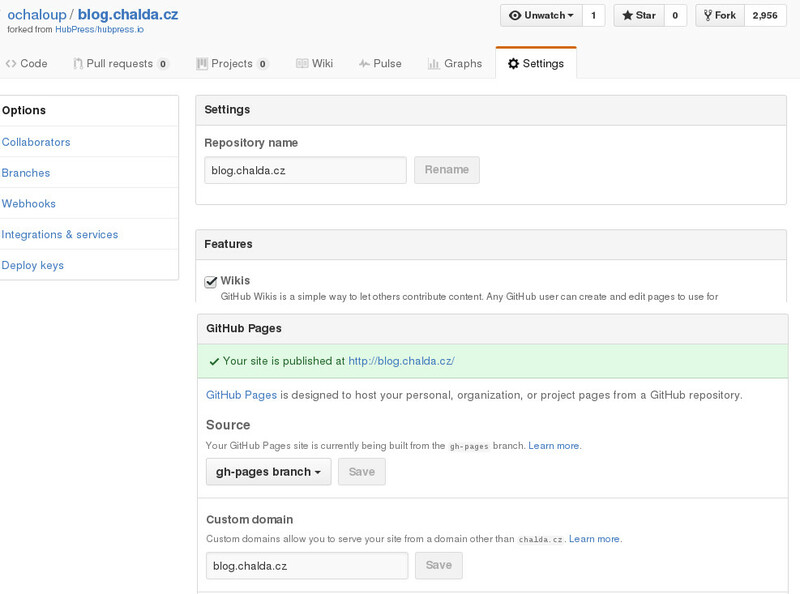 Fork github repository and set gh-pages as default one. Having set the custom domain will cause creation of CNAME file under root of your github repository. The content of the file is just the name of your custom domain - thus what you put to the field. When all is set fine you can now go to HubPress.io admin page which is hidden under subaddress hubpress. In my case it’s at path http://blog.chalda.cz/hubpress. You need to log in with credentials which you use to login to GitHub. HubPress.io calls directly the GitHub identification service to confirm that you are the owner of the repo. Afte the first login you can see empty screen. That’s ok and just create a new article. [Updated] for version 0.8.0 it seems that there is already shown information that you have 0 posts so it’s not misleading already. That’s more or less it. Now it’s time to write and experiment.